Danfoss Power Solutions has added two high-flow proportional valves to its PVG portfolio, expanding its range of low to high-flow capabilities for OEM customers with demanding applications. A CAN control unit is part of the valves. 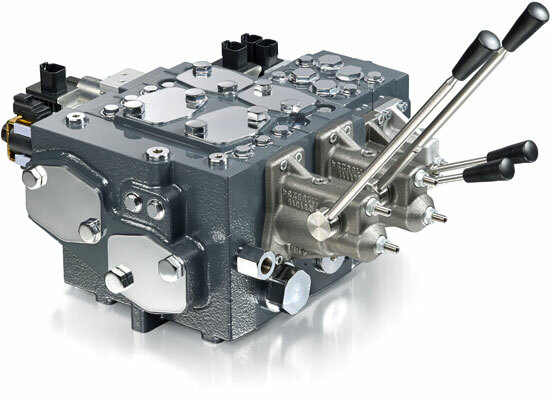 The PVG 128 and PVG 256 valves are designed to integrate with the existing line of Danfoss proportional valves — PVG 16 and PVG 32 — allowing modularity from low to high hydraulic flow within the same valve stack. These high-flow valves are for use on demanding applications such as large mobile/truck mounted cranes, crawler cranes, ship cranes, winches, drilling machines, etc. where flow and durability is essential. Using the PVG 128 and PVG 256 together with other valves in the PVG family allows OEMs to enhance machine performance while improving productivity and lowering energy consumption. The PVG 128 and PVG 256 feature individual load-sensing A/B relief valves, which limit the pressure on each work port of a valve section, reducing material stress. The valves also provide additional diagnostics, which means a CAN network control unit lowers the cost of installation and ensures data availability on the machine’s existing bus system. Each valve section has a manual control that allows work to continue even in the event of electrical power failure. “We designed the PVG 128 and PVG 256 valves to offer as much value as possible to our off-highway OEM customers. They can use these valves to achieve the high flow necessary for their demanding applications, but can combine them with the PVG 32 and PVG 16 for lower flow functions in their machines as well,” said Knud Meldgaard Jensen, Global Product Marketing Manager for Danfoss Power Solutions. The addition of the high-flow valves extends the range of hydraulic flow within the PVG series up to 300 liters (79 gallons) per minute with the PVG 128 and up to 400 liters (105 gallons) per minute with the PVG 256. A special turbo version of the PVG 256 valve is also available, increasing the hydraulic flow up to 500 liters (132 gallons) per minute. The high-flow valves are designed to work in conjunction with the smaller valves in the PVG portfolio, delivering consistent performance throughout the entire valve range. A total of four different valve sizes offer OEM customers more options — all of which utilize the same electrical and hydraulic interfaces to fit the exact flow needed for each application. The use of common parts within the PVG platform means the high-flow valves can be incorporated into existing applications. The valves offer multiple spool sizes that can be adapted to meet customers’ specific application needs. Available spools are a combination of linear and progressive, meaning the same spool can be used for all configurations with and without LS A/B relief valves.